This was the scene in our front yard as I arrived home a little while ago from Jill's bridal shower. 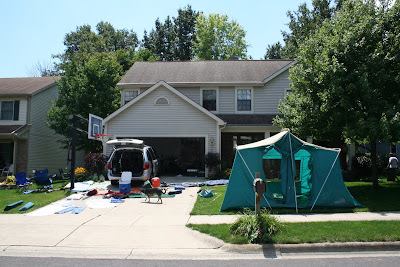 The boys had also just arrived home from their "bachelor camp-out." Surprise: it rained overnight. Mind you, the wedding is in 28 hours. A minute ago, a woman pulled up and asked, "are you having a yard sale?" It's now two days until my son Mark's wedding. Saturday, August 1, 2009 at 6:00 p.m. to be exact. I know the bride and her mother are supposed to be the mush-brained ones, but a groom's mother has a share of brain freeze, too. CONFESSION: twice in the last 24 hours I've had to pull out the invitation to re-check the TIME OF THE WEDDING. Come on! Guilt: Once the boys started finding far-off places to move, getting married and that sort of thing, I devised a empty-nest rule, and that rule is: if you're a) getting married and/or b) buying a house, you WILL sort and pack up your twenty years of accumulated belongings. This includes trophies, baseball cards, report cards and ninja turtles. It goes with you. There is an escape clause to the rule: if you are moving to a small apartment, you may store your boxed belongings in our crawl space. For a time. I thought about imposing a rental fee, but decided against that. After all, I do want to be cared for once Alzheimers sets in. So. The stressed-out, tending-to-a-hundred-wedding-details groom finally made serious progress on his room and belongings. Then I felt guilty. As I kept driving home the reminder to "clean out your room," it occurred to me that maybe I was being a bit heavy-handed. Even seeming overly-anxious to have him out. For good. Ugh. Mean old mother. I started writing this post last night but got too sleepy and went to bed. Now it's 5:00 a.m. and I'm wide awake! Wedding week camping trip?! The groom's brothers decided that a bachelor camp-out would be great fun. Tonight. Thursday. 48 hours before the wedding. Seeing as how both brothers live out-of-state and are ARRIVING today, they need a little help gathering the equipment. Tent. Sleeping bags. A skillet. Matches, flashlights, plates, cups. OK, I DID offer to help. But I was thinking more along the lines of making some food. It's turned into more than that. Boys, you WILL care for me when I'm old, won't you? Out in the yard: Puttering in the yard is great therapy. My neighbors will see me there throughout the week. I just can't be stressed out at geraniums and hostas. Hotel Haller: With four extra people staying at the house, there are a few issues to address. Who sleeps where. (I think the groom will be sleeping in the basement with all the wedding gifts.) Finding towels and sheets. After 30 years of marriage, I realize the towels and washcloths don't match. Oh, well. And there's some food prep going on, too. Yep, it's a crazy week around here. Today will be especially frantic, with airport runs, camping trip packing and last-minute vacuuming up dog hair. But I'm faithful it will all fade when I see my tall and handsome son standing with his radiant bride on Saturday evening! Happy birthday - I-actually-wrote-this-on-your-birthday-two-days-ago - Beth!! Beth and I met over thirty years ago, both of us newlyweds. In fact, I was her wedding "photographer," though it's a stretch to claim the title ... seeing how far photography has come and my daughter is a real, live photographer and would probably snicker at those wedding snapshots. Anyway. Back to Beth. Since those newlywed early-friendship days, life has pushed and pulled and brought us to a whole new place. We drifted, I would say, in the way that our hearts weren't closely knit. Then, unknown to us both, we each encountered God and began growing in relationship with him. This turn in our lives drew us together in most miraculous ways. 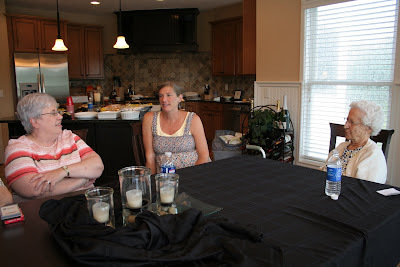 Beth and I now share our joys, hurts, questions and even laughter with a deeper connection. The photo? 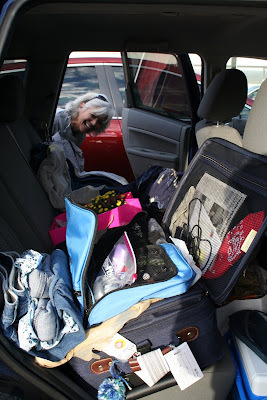 Its caption might read, "my car is essentially a big purse." This was in Tampa during our wild ride at the World Series last fall. The woman takes everything, I mean ev-er-y-thing on a trip. Yeah, Beth's car is trash, but SHE is a treasure. How I love to google. It's a great tool for those who like to learn and figure things out. Today's challenge was not one but TWO dripping faucets. Definitely time to google. So I googled away. I know, it's a pretty simple operation, dripping faucets. But still, I wasn't quite sure. So I googled. And read. And turned off water. (Not entirely necessary, I don't think.) And disassembled said faucets. And poked and pulled out the washers. And trotted off to the hardware store where a salesboy helped me identify just the right rubber gasket. Which I guess is the googly-term for washer. Within 40 minutes, voila. Faucets dripless. Oh, I do love googling. Dinner. It strikes fear in every woman, especially mothers. Even those who are into "once-a-month cooking" and are the most outrageously-organized women on earth still have those days when the approaching dinner hour looms like a not-studied-for algebra test. This week, I decided to take the "use what we have" challenge. No grocery trips, last-minute or otherwise, to assemble a dinner. Monday - some kind of chips/chili/cheese/chicken/tomato plate. Hot and tasty from the oven. Lacking sour cream, we used ranch dressing. Tuesday - found a bag of stew beef in the freezer! It'll go in the crock pot with onion and beef bouillion and in the afternoon it'll be joined by some noodles for beef and noodles. Green beans (whoops - canned!) and homemade bread I found in the freezer will round out the meal. Wednesday - corn fritters. Like pancakes, made with cream-style corn. I know it sounds dubious, but be flexible, ok? If you keep a can of cream-style corn in the pantry, you can always whip these up for a quick supper. Thursday - quiche. Found a Pillsbury pie crust in the fridge and everything else happens to be in there, too. Apples & oranges round it out. Taking it to a more serious level, we are undeniably the fattest and best-fed people on the planet. We would all do well to eat what we have and be exceedingly thankful for it. Really now. Why not? Take the "use what you have" challenge and let me know how it turns out. We lost "the most trusted man in America" yesterday. He was 92. 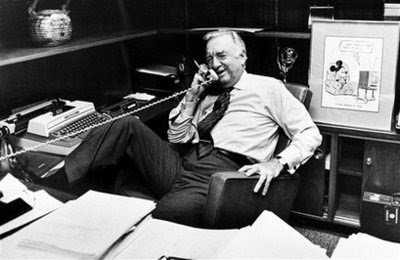 Walter Cronkite was the only voice of news I knew throughout my childhood. He delivered the day's news at 6:30 every weeknight. Kennedy's assassination. The Vietnam War. War protesters, Woodstock and Watergate. In a world of turmoil, he was our calm and constant presence. I remember, I guess at the age of enlightenment, realizing that Walter Cronkite might someday die like everyone else. And I asked my dad, "well, who will report the news?" I couldn't imagine anyone else on earth we might want in our living room every night. 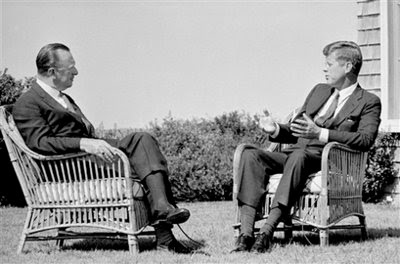 After Walter Cronkite retired in 1981, others took his job. But for me, no one really filled his shoes. He was like a grandfather, warm and familiar, but fully capable of bringing the world to us. He ended every newscast with "And that's the way it is." 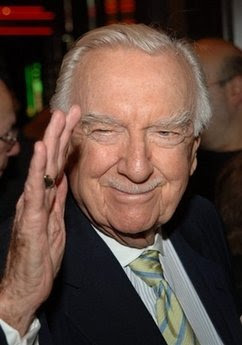 Farewell, Mr. Cronkite. You were a part of my life and I've missed you. But that's the way it is. Weddings are a joyous time. And, I have discovered, hectic and heavily-planned with endless details. From my research, this is a 21st-century phenomenon: lots and lots and lots of wedding details. Weddings a generation or two ago seemed simpler. happy anniversary, Dan and Jenny! Two years ago today, my son Dan married his college sweetheart Jenny. Just before we all left the house for the ceremony, the six of us prayed together at our front door. It was a sweet and tearful moment. The first time we stepped through that door, Dan was not yet five years old. He bickered with his brothers and slept with matchbox cars. And here he was, about to become a husband. Events such as a child's wedding puts us mothers into a divided mess. One part of my heart was thankful and ecstatic for Dan and Jenny's new life together. Another part was a sentimental slop of emotions and memories. Dan and Jenny love each other and God and I'm amazed by their commitment to the important things in life, especially at such a young age. 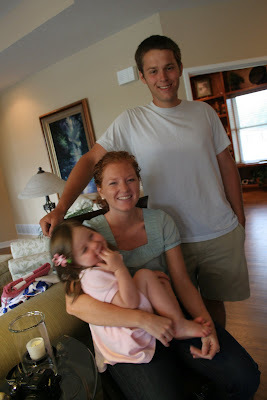 When they become parents in about six months, well, we all know how a first child turns your world upside down. It'll be fun and exhausting and crazy and amazing. Happy second anniversary, Dan and Jenny. And many, many more! I am amazed by families who stage family reunions. Faithfully. Regularly. One family I know holds one every other year, in a different part of the country: say the desert southwest or New England. Impressively organized. Somehow, the family I grew up in scattered wildly and, well, wasn't all that big. And the people who might have organized reunions passed away rather young. So in my family, my mother-in-love's side is the one who holds family reunions. In recent years, the tradition waned. The queen of family reunions, Aunt Jean Thayer, passed away several years ago. What a fun lady. Never married, Jean called all extended family HER family. She kept scrapbooks and traced genealogy lines back hundreds of years. So. Today the Thayers gathered once more. Here in Delaware. Maybe 35 of us. 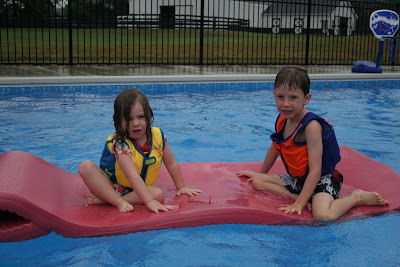 Some of the older cousins laughed over memories of childhood together. Other cousins barely know each other. 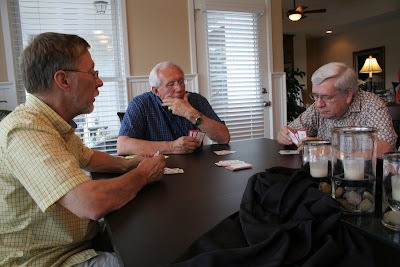 But good food, a swimming pool, and an "old men's card game" served to draw us all together. 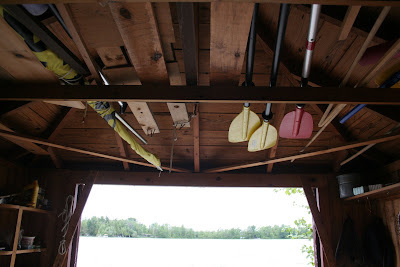 I love an old wooden boathouse. It’s all cobwebby and musty until the doors are thrown open to summer. Ours has stood bravely against the raging, frigid storms of 50 Michigan winters. She harbors pails and shovels, nets and paddles, kayaks and tackle boxes. Life preservers, ropes, tools and tackle adorn the walls in delightful disarray. She begs for a new coat of paint, unable to hold on to the last one. So we set to work. Swiping at cobwebs with the old straw broom. We mix and pour and brush on paint. 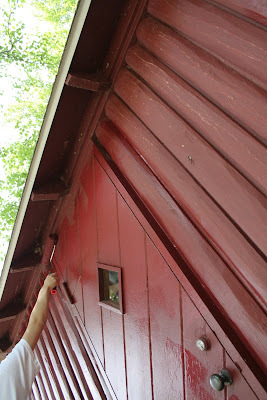 A deep “Cottage Red” goes not on smooth walls, but on knotted cedar half-logs and all spaces in between. A garter snake, looking for the afternoon sun, slithers over Katie’s foot, as if surveying her work. 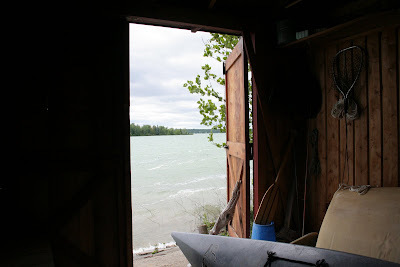 Soon the boathouse is renewed, softly gleaming again in sunlight reflecting off the lake. And I remember. 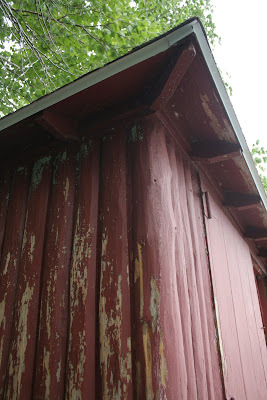 At six years old, I slept in a boathouse beside a lake while on vacation with my family. The wind and waves both scared and comforted me: their power upon me while also lulling me to sleep. And I wonder. A boathouse is here waiting. For grandchildren whose parents might allow them to sleep on a cot, paddles overhead, lulled to sleep by the wind and waves. 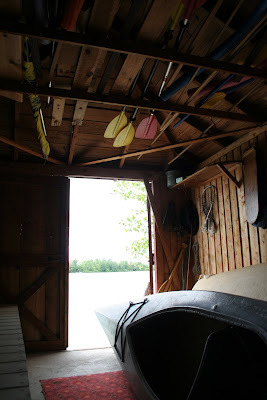 Inside a boathouse.